Avengers: Infinity War (2018) Directed by Anthony & Joe Russo. Today I went to the opening screening at (oddly) my local art house cinema, The State in Hobart. I say oddly, because this isn’t high art, it couldn’t be considered quirky and it certainly isn’t an independent production. 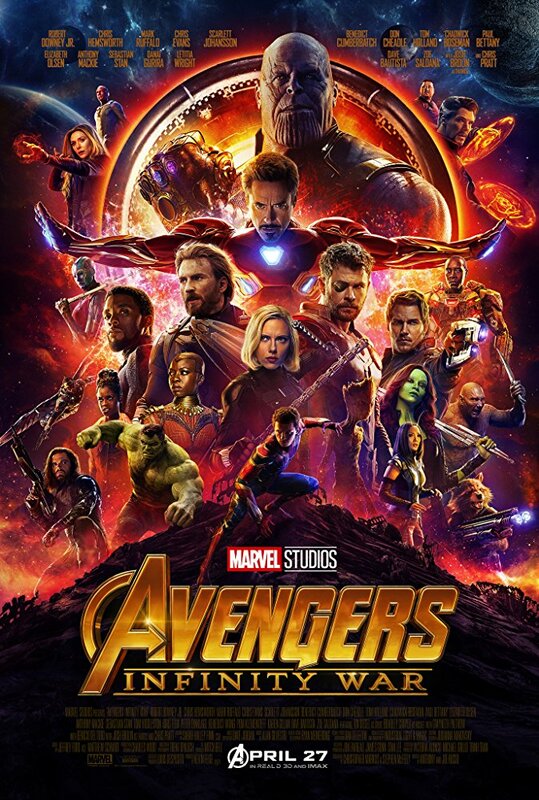 This is the 19th movie in the MCU – a decade of blockbuster comic book cinema, which has changed how we think of big, loud action films and helped bring strong threads of fantasy and science fiction narrative into mainstream movie-making. Essentially, Avengers: Infinity War is the culmination of all those films, where incredibly well-paid (arguably overpaid) actors get to dance around in front of green screens, dangle off wires and sometimes wear motion capture (or mocap) suits, all the while acting their hearts out. In many ways, the MCU can be seen as everything that’s wrong with homogenised, formula-driven mainstream cinema – but I cannot begin to express how much I enjoyed this film. Yes, there are faults. I think stylistically, the Russo brothers played it very safe, employing design and style elements from previous films which stand out against original scenes such as those on Thanos’ home planet Titan, which become almost too generic and to my eyes, bland. There was a moment early in the film where the CG really stood out – and not in a good way! – but fortunately, this was the only point where I felt the strain of all those pixels trying to be “real”. Also, unlike nearly all previous films in the MCU, this is not a stand-alone product and requires at least some background knowledge. The other is Captain America: Civil War (2016), which acts in many ways as a set up for this film. Looking at it as a classic three act structure, we leave this story about halfway through the second act, and things are looking very bleak. I’d be lying if I said I wasn’t miffed that I have to wait another year for the conclusion, reminiscent of Harry Potter and the Deathly Hallows: Part 1 (2010). But unlike the Potter experience, where nearly everyone I know had read the books and we knew what was going to happen, in the MCU not everything plays out like the comic book versions. Thanos is a particularly complicated and multilayered villain, far more I think than in the comics. The rationale behind Thanos’ desire to reduce populations is psychopathic and extreme to say the least but he truly believes it – and despite the character being a CG/mocap mash-up, Josh Brolin makes us believe his sincerity too. And Brolin’s scenes with Zoe Saldana’s Gamora had me immediately thinking there’s going to be a lot to talk about in feminist film circles regarding Thanos’ “love” for his adopted daughter. I must also note there’s no mid-credit sequence after the film to set up part two (currently listed simply as Avengers 4), due for release in May next year. Having had a few hours to think about it, I think it’s because the whole film is the set up for the next movie. But I do encourage everyone to stay to the very end for a particularly pertinent sequence that leads down yet another narrative rabbit hole.